There are five standing committees within the Haddonfield Civic Association, more information on each is below. The Education Committee shall consider and recommend matters relative to public education. The committee shall also administer the Bradshaw Essay Competition. The Information Technology Committee shall be responsible for coordinating technological pursuits and functions as they pertain to and are supportive of the mission of the Association. The Membership Committee shall promote the continued growth of the Association; solicit new members; oversee the collection of dues from all members; and maintain a record of the members of the Association. The Municipal Affairs Committee shall consider and recommend matters pertaining to the general welfare of the Borough of Haddonfield, including but not limited to, legislation, public health and safety, public utilities and municipal government. The Publicity Committee shall publicize the activities and projects of the Association and publish a newsletter to inform all members of its activities. The chairperson of the Publicity Committee shall be designated the editor of the Association’s newsletter. Chairpersons, as well as co-chairpersons, are appointed by the President. Depending on the needs of the Board of Governors, other temporary committees may be created. A town resident or General Member of the Haddonfield Civic Association can participate in BOG activities in a non-voting position by joining a committee as a member. The HCA proudly maintains a close working relationship with the Haddonfield Foundation, and provides a member representative to the Foundation to help the two organizations remain cognizant, aware and supportive of each other’s goals, programs and objectives. Since 1983, with support from the community, The Haddonfield Foundation has provided vital early “seed money” to more than 100 local grassroots organizations and projects enhancing our quality of life. Thanks to the Foundation, Haddonfield residents are fortunate to be able to participate in a unique range of wonderful programs, activities and services for residents of all ages and interests. Children and parents have enjoyed the Foundation’s support of Haddonfield Child Care; public and pre-school playground upgrades; drug abuse prevention programs; soccer, tennis, Little League, varsity sports and drama club programs; the Haddonfield Public Library; and dinosaur sculpture. The Foundation has provided financial assistance to Candlelight Shopping, the beautification of Kings Highway, First Night, and the installation of cardiac defibrillators in police cars and public buildings to save heart attack victims. For senior citizens, The Haddonfield Foundation helped start and fund vital programs such as housing assistance, the Mabel Kay House, and Interfaith Caregivers. 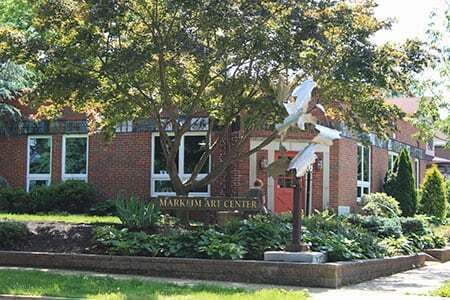 And to support the cultural arts, The Foundation has played a key role with the Markeim Art Center, Plays & Players, Haddonfield Symphony, Indian King Tavern Museum, the Historical Society, Haddonfield Farmers Market, and the popular Haddonfield Fine Arts and Crafts Festival. 100% of your contributions are used to support worthy causes in Haddonfield. The Foundation is managed by a volunteer Board, and modest fundraising expenses are covered by endowment interest. Every dollar of your contribution is invested prudently and distributed thoughtfully. Please visit http://www.haddonfieldfoundation.org to learn more about this great organization, and discover how you can became a part of the wonderful seeds they sow.